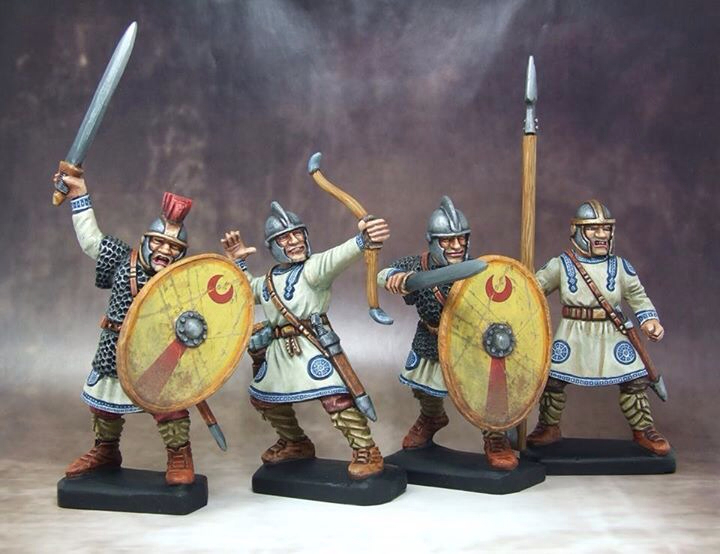 Gripping Beast recently posted a preview of new 28mm plastic figures on their Facebook page - late Roman infantry. The aim is to have these available for Salute, with the new Age of Arthur SAGA supplement available 'soonish'. The photo shows 3-ups, but they do look fantastic! The Beast will apparently also be producing plastic cavalry AND Germanic tribes! Apparently they can be mixed with the GB Dark Age Warriors box so should prove very useful. WHOOT!!!! FANTASTIC NEWS! Age of Arthur roll on please! The plastics look nice as well. Must admit that I'm very much looking forward to this new supplement as well! It's not a period that has ever interested me greatly, but these are indeed nice figures. I just wish I could paint as well on 28mms as some people can on 3-ups!